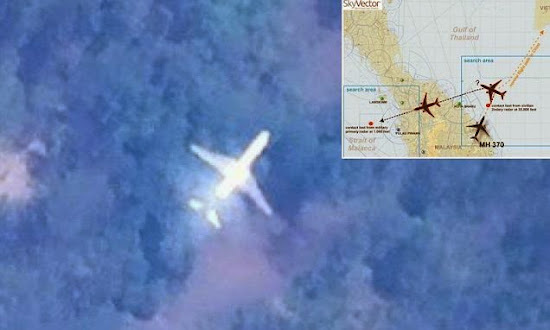 A satellite image appears to show the missing Malaysian Airlines flight MH370 in the skies above a jungle. The image is taken from Tomnod, the map search website currently being used by hundreds of thousands of people in an attempt to search for missing passenger plane, and was posted on Reddit on Sunday. The authenticity of the photo has not yet been verified and the region depicted in the photo is as yet unknown. Intriguingly, the plane appears to have been painted white. The image was found by an university student in Taiwan, according to Taiwan's China Times. The image has surfaced at the same time as the news that Malaysian villagers claim to have seen the missing Malaysian Airlines jet flying over the north east of the country at around the time the aircraft is thought to have made a 'U-turn'. At least nine people - tuna fishermen, farmers and villagers - in Kelantan in Malaysia have made reports to police about seeing lights in the sky and some said they heard the loud noise of an engine. Similarly, residents of a tiny island in the Dhaalu Atoll in the Maldives say they saw a plane with Malaysia Airlines markings in the early hours of Saturday March 8. These accounts appear to match the conclusions of investigators who say the jet flew low to avoid radar after making a sharp turn and heading west from its course over the South China Sea. Investigators told the New Straits Times that they were now convinced the aircraft flow low over the village, which is in the north east - exactly the same area where the villagers and fishermen in Malaysia who saw bright lights in the sky and heard noises on the night the jet vanished are living. Investigators told a Malaysian newspaper that the Boeing 777 had dropped to a lower altitude - under 5,000ft - to avoid ground radar, using the surrounding terrain as a sonar barrier. This type of flying is considered to be dangerous and risky, because it places tremendous pressure on the frame of the aircraft - and flying low at night without radar assistance could lead to the plane crashing into trees or mountains. The first report of a 'bright light descending at high speed' came from Mr Alif Fathi Abdul Hadi, 29 who said he saw the light heading towards the South China Sea at 1.45am on the night the aircraft disappeared. Businessman Mr Alif lives in Kampung Kadok, in the far north west of the Malaysian mainland, close to the southern border of Thailand - and the light he witnessed would have been several miles to the north of the flight path the jet was on before it vanished. Lending credibility to the account by Mr Alif is the claim by fisherman Azid Ibrahim, 55, who saw a bright light streaking overhead at 1.30am on Saturday, about 100 miles south of where Mr Alif had seen the light. Mr Alif told said the bright light was the type that aircraft use when taking off and landing at night - like a car uses its headlights. 'I was walking towards the rear of my house when I saw the light, and wondered where it was heading to,' he said. 'The airspace here is like a highway for aircraft and they usually travel in routine patterns. His description tends to indicate that if the light he saw was on the doomed aircraft, it had turned north instead of continuing on its regular north-easterly flight path. Mr Alif said the aircraft he usually sees fly across the sky for as far as his eyes could see but the light he saw in the early hours of Saturday vanished from view behind a line of coconut trees. While he thought nothing of it at the time, when he learned about the missing aircraft MH370 the following day he lodged a report with police. Mr Alif's account tended to coincide with that of fisherman Mr Azid who told the New Straits Times: 'Usually, lights from an airplane look like distant stars at night but the one that I saw was big, as the aircraft was flying below the clouds. The Malaysian Airlines jet went missing 1.30am on Sunday, March 9. It is not yet known what has happened to the 239 passengers and crew on board.